Last week Betsy and I drove out to Fort Stockton, Texas. In many ways, the drive was a complete disaster. I-10 was shut down due to a pretty horrific accident that delayed us by an hour and a half. In order to make up time so that we wouldn't be late to our lunch meeting, we had to pick up the pace which was a strategy that was not appreciated by a Texas Highway Patrol Officer outside of Sonora. I didn't think a Prius was physically able to get a speeding ticket. Apparently I was wrong. Despite that, some rain, some hail and a plague of locusts, we somehow managed to pull into Fort Stockton just as the meeting was getting underway. We'd been asked to help the Fort Stockton Community Theatre develop concepts for a new performance space and we wanted to meet with area stakeholders to talk about the current role of the theatre in their community and what they would like to see it become. It was a great wide-ranging discussion about big goals and it was incredibly helpful for us to understand how this group defines itself and how it imagines its new theatre could play a larger role in the Fort Stockton community. Architecture can't do everything but it can provide the framework for change to occur. The people we spoke with see their new theatre as a way of improving their city - a way to introduce people to the arts who might not otherwise be interested in such things. We feel incredibly lucky to have the opportunity to be a part of this effort and we look forward to working with them to create a facility that fulfills their functional needs while at the same time creating something more something unique to Fort Stockton. 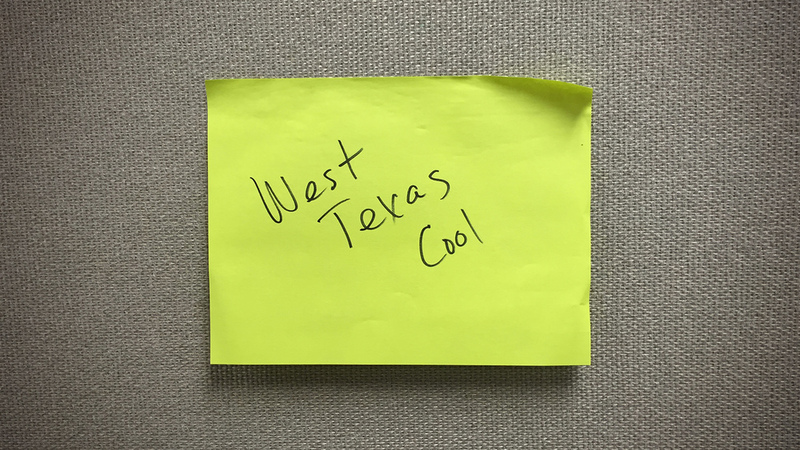 We what to help them create a place where young and old like to go to see a play; a place where the rancher and the oilman likes to take their family; a place that is uniquely suited to Fort Stockton; a place that is in the words of one of the participants of the lunchtime discussion, is "West Texas Cool."